Erroneously, the works of Colus Havenga have frequently been ascribed as minimalist art, though he is too much of a visual, Romanticist poet for the purity of minimalism’s ideals. Yes, his works tend to be hinged on rigid, geometric symbolism, but these aspects are woven into and impaled through still, sleek, stylized depictions of wildlife. Often revisiting his native South Africa’s indigenous animals within his sculptural art, this currently San Diego-based creator is best known under his eponymous mononym of Colus, which he began employing in 2007 as an apparel brand name. Experimenting sculpturally as early as 2010, Colus’ true designer toy debut was 2013’s factory-produced The Hunted edition from Kidrobot, the following year seeing him collaborate with the company again with his Harvester design for their Art of War series. In the interim, Colus began experimenting with 3D printed resin forms, like his Ivory elephant head (2013), a direction he’s used repeatedly to self-produce works since, the most recent instance being those in his Deadweight solo exhibition at Beacon, NY’s Clutter Gallery. 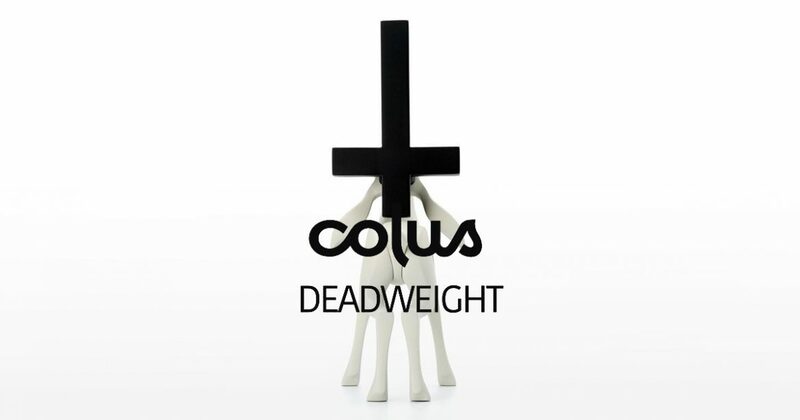 Stark and subtle, Colus’ artworks boldly embody rich contrasts, not only in the juxtaposition of stiffly structured and organically fluid components but also by employing primarily black-and-white palettes. With this signature aesthetic found throughout his Deadweight solo exhibition, each work displayed is a love letter to simplicity, their perfect execution being anything but simple with no unnecessary embellishments to hide behind. And this makes the exhibit’s title all the more mysterious, as Deadweight has no oppressiveness, no burdensomeness, just beautifully elegant forms to be appreciated and pondered. Having had its opening reception on Saturday, August 11th from 6-9pm, all works in this exhibition will remain on display until August 31st, 2018 at the gallery’s physical location (163 Main Street, Beacon, NY 12508).